Wood Jewelry Box with Inlaid Motifs from Brazil, "Handsome Geometry"
Handsome geometric motifs decorate the surface of this jewelry box, achieved with marquetry inlay techniques. 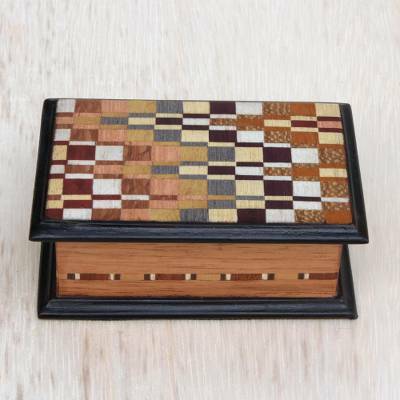 Raffaello and Dayse diligently handcraft this box from Brazil, using mahogany and a variety of exotic local woods for the elegant array of colors. The lid of the box lifts off to reveal a velvet-lined interior in black, perfect for storing your valued jewelry. You can find inlaid wood jewelry box 'Handsome Geometry' by Raffaello and Dayse in jewelry boxes categories such as Geometric Boxes and Wood Boxes. Enjoy exploring these sections for other Novica treasures. "Wood inlay is what I love to do. I finally found my path in life." Born in Italy, Raffaello has lived in Brazil since he was six years old. He works in the art of wood inlay. Dayse studied business administration, but she left her job to work together with her husband. "When I was 17, I joined luthier Severino Marino in his workshop, then later worked with master artisan Simões," Raffaello says. "For a long time, I held several jobs — cook, images editor, crafting stringed instruments. I embraced music as profession for 16 years after studying it at the University of Rio de Janeiro; there I was also in contact also with fine art. "I was delighted with the possibilities and variety of objects I could create with re-purposed woods from buildings that had been torn down, with discarded materials, and I collected everything I found — doors, windows, benches — until I discovered shops that specialized in the sale of this rescued wood. "After 10 years working and researching, I am developing my own language in art and in the conception of decor objects to bring beauty and happiness to friends and shoppers.